"Charles accompanies Diana back home to a grieving Britain"
It wasn't long before we, too, were plugged back into the worldwide news of sadness and shock. Even if you go on a "news diet" for a few days, the Big News most definitely will catch up to you. Depressing as it can be, it's not so much the Big News that worries me. It's the "little" news, the faux news, the non-news that has a way of insinuating itself into our everyday lives like an airborne virus. The Big News may catch up to us, but it's the Little News that sticks in our throat like a nasty cough that never quite goes away. In the book Simplify Your Life: 100 Ways to Slow Down and Enjoy the Things That Really Matter, author Elaine St. James writes about two of her friends: "He is a physicist; she is an artist. They've never watched the news on television. While most other people are reading the morning news, this couple is reading their favorite novels. They are well-educated, literate, interesting, vital people who long ago came to the conclusion that reading the daily newspaper did not contribute to their mental or emotional well-being, and they arranged their lives accordingly." As the author says, "Cutting back on the negative input you're subjected to every day is a positive step toward simplifying your life." So, unless your job requires you to be plugged in to the minutiae of the universe, consider a "news diet." Start slowly: Try one morning without reading the news. Read a book or listen to music instead. Or go for a walk. Or cuddle with the dog. Anything but scanning the headlines. See if you feel better or worse. I know how I felt, and how I still feel, without the endless barrage of "news." There are very few things I enjoy more than getting lost between the covers of a book on a summer vacation. I still remember reading Stephen King's The Shining on a family vacation to Pennsylvania Dutch Country when I was 15, racing back from the pool and past Room 217 (the scene of intense creepiness in the book) at top speed, scared silly but exhilarated. I can remember other hotels, other beach houses, shady hammocks, sandy-white beaches...and for all of those places, I remember the books I was reading while I was there. Because summertime isn't just about the sand and the surf, it's about the books! The Unlikely Pilgrimage of Harold Fry by Rachel Joyce. Aside from the original characters and engaging story, this book made me re-evaluate the simple act of walking. (Yep, walking.) It's not just a way to get from one place to another, it's a chance to deeply absorb the world, including your own inner world. Extremely Loud & Incredibly Close by Jonathan Safran Foer. I always love books told from a kid's point-of-view, and the precocious nine-year-old who narrates this story has a captivating (and really sad) tale to tell. I Was Amelia Earhart by Jane Mendelsohn. This book is dream-like and poetic, an island reverie. The Remains of the Day by Kazuo Ishiguro. I cried throughout the last chapter. That's the mark of a good book! I'm not going to add any notes about these choices because they're classics. If you don't already know the stories, I'm not giving away anything here! Waiting for Birdy by Catherine Newman. I laughed a lot, I cried a little, and I totally loved this book. Bringing Up Bebe by Pamela Druckerman. I remain fascinated by how the French manage to raise a nation of unfussy eaters with sophisticated palates. The Daily Spark: Poetry by Spark Publishing. Technically, these 180 prompts are designed for students to explore the craft of poetry, but adults also will be inspired to pick up a pen and try their hand at some verse. Everyday Blessings: The Inner Work of Mindful Parenting by Myla and Jon Kabat-Zinn. "Mindfulness" is one of the biggest buzz words around, but being a mindful parent in the age of 24/7 streaming technology is a formidable challenge, no? Trees Make the Best Mobiles by Jessica Teich and Brandel France de Bravo. I tend to shy away from parenting advice books because every child is different, but this book shares low-key wisdom about how to relax into parenthood and stop fretting about all the stuff your child supposedly "needs." Silence: How to Find Inner Peace in a Busy World by Christina Feldman. Soul-soothing. On nearly every page, I found something that resonated with me about seeking out the quiet moments and learning from them. How's that for overloading your beach tote? Your turn: What book would you add to this summer reading list? Let's hear it in the comments section! 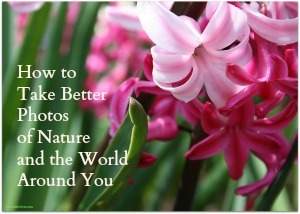 Don't miss out on a super online course to improve your summer shots! Less than three weeks to register for my July 2014 photography e-course, "How to Take Better Photos of Nature and the World Around You." Click here for details! Even if you have a full-time job, you'll be able to take this online class at your own pace. Joyful Reads for the Weekend, Vol. 24: Now THAT'S Great Advice! From Marquita Herald at Emotionally Resilient Living: Choosing Happiness. From Jennifer Miller at BootsnAll: Defining Your Own Values & Crafting Your Own Meaning For Life. From Clara Minieri at Thought Catalog: Why Books are the Best Friends a Kid Could Have. From Ashley Garrett (whom I met at BlogHer last July but just remembered to look up--now I'm sorry that I wasted so much time because she's a really funny writer) at Baddest Mother Ever: The Wind in My Hair. And one more from BootsnAll (because Jennifer really knows what she's talking about! ): Do Hard Things. The photograph in this post (I call it "Red Tulips in the Rain") is available as an art print (framed or unframed) in my Society6 shop.